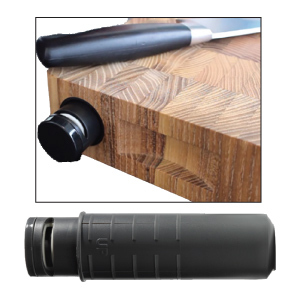 This new device for cutting boards is the perfect solution to dull knives. The MakeEdge™ sharpening system is easy to use. Push in the end and the sharpener pops out. Just pull the knife between the ceramic stones 2-3 times each time you use the cutting board. It can be used with standard rounded serrated knives. The ceramic stones do not need do not need to be maintained except for turning them to the other side after many hours of use. The unit mounts in a 1-1/2" diameter hole 4" deep.